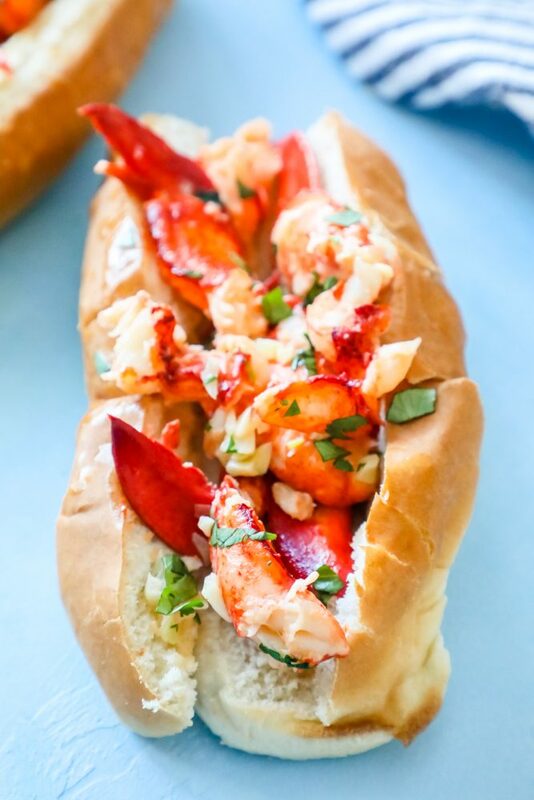 Garlic Butter Naked Lobster Rolls Recipe – delicious garlic butter lobster rolls sandwich with no mayonnaise for a rich, flavorful naked lobster roll everyone will love! I feel like this is the most controversial post I have published to date. I realize I am about to say something so terrible, so horrifying, readers may never look at me the same way again…. but…. I make lobster rolls completely NAKED – with NO MAYO! I realize this is the stuff of horror for many people, but trust me on this – naked lobster rolls are totally a thing. 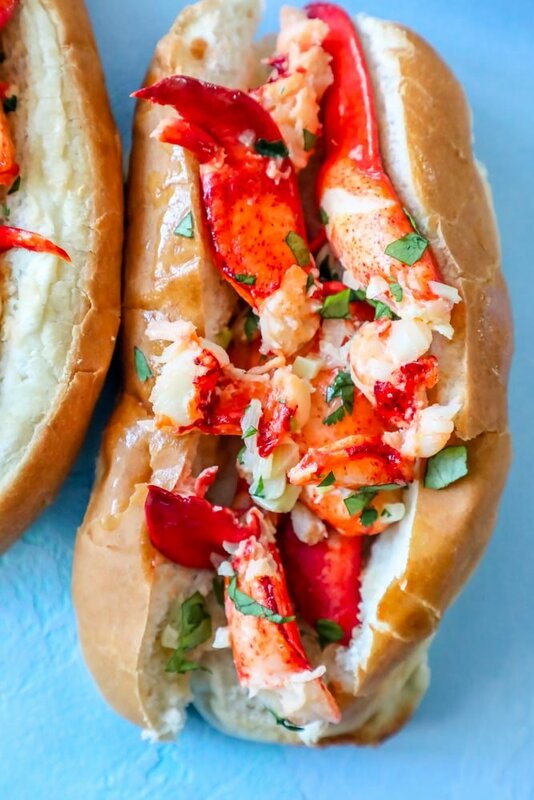 These lobster rolls are oozing with garlic butter sauce flavor that bring out the sweet and buttery lobster meat flavor – and for those of us with limited access to fresh seafood, it even makes frozen picked lobster taste fresh-caught. 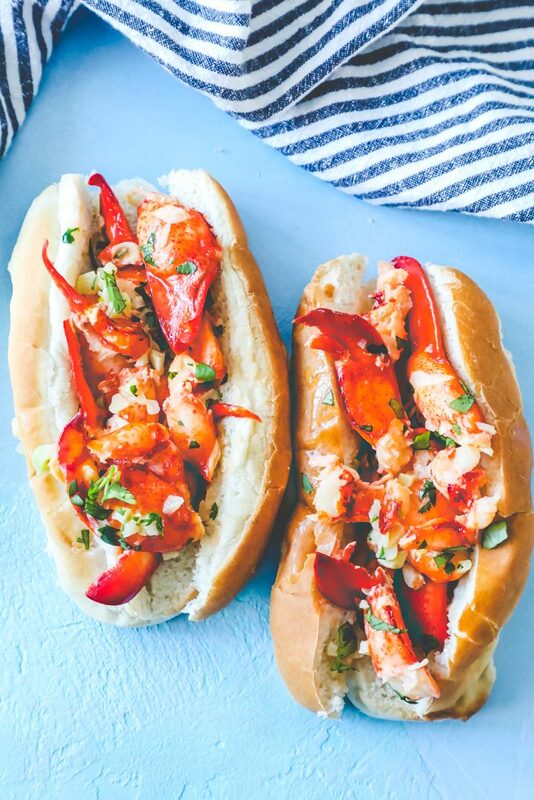 This easy lobster roll recipe is one you’re going to want to make again and again! Just Take Me To The Garlic Butter Naked Lobster Rolls Recipe Already! 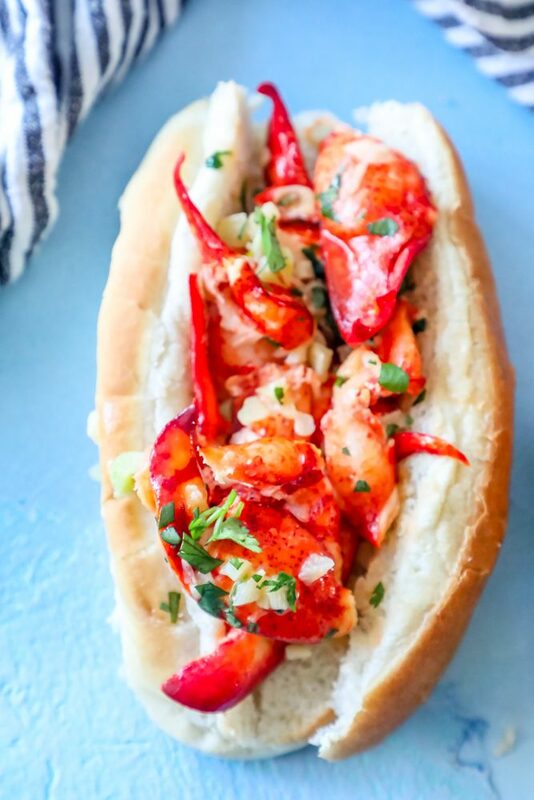 I get lots of questions and comments on my recipes and posts, so I try to provide as much information as possible in them – so you get this amazing garlic butter lobster roll recipe – but also tips on HOW to make it, so it turns out great. If you’d like to skip these tips and get straight to the recipe, please scroll to the bottom of the page, above the comments. You might think a lobster roll without mayo is crazy – or dry – or even missing something – but these lobster rolls have plenty of flavor and juicy lobster and garlic buttery goodness – you won’t miss a thing. This recipe calls for 1 pound lobster meat – which can either mean grilled, boiled, baked… however you love to prepare lobster. For my favorite way to broil lobster tails, click here. Since I don’t live in an area with fresh lobster that I can get regularly, I have to rely on frozen lobster. Normally I try to steer clear from buying pre-cooked seafood and shellfish, because I think it can taste fishy – in this recipe, we’re using so much garlic it works great with pre-cooked frozen lobster meat – which is available in most grocery store’s freezer sections. Just make sure you’re buying picked lobster meat, and not imitation lobster meat. 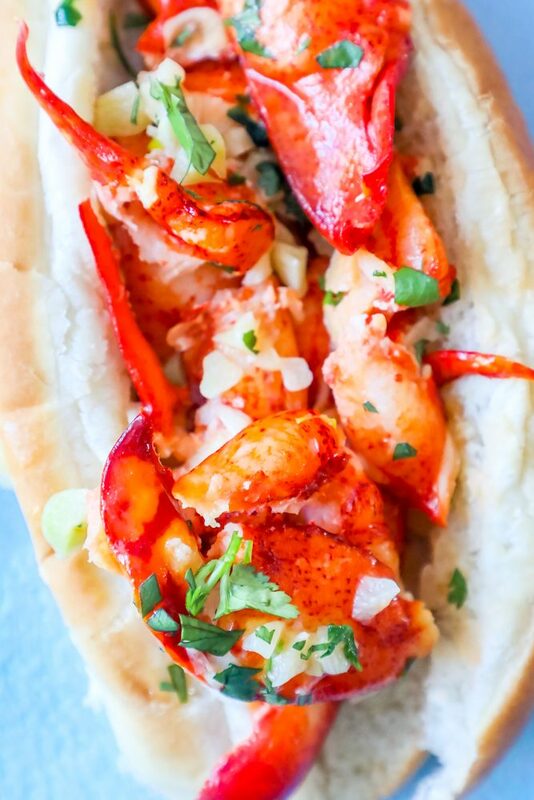 Lobster Rolls are traditionally served on New England style hot dog buns – which are hot dog buns cut down the middle from the top (top-down buns). If you can’t get a New England style hot dog bun, you can use regular hot dog buns, a fluffy, buttery hoagie style roll, or even thick texas toast style bread. I personally like to butter the inside and outside of my lobster roll buns and then toast all sides on a hot griddle top. 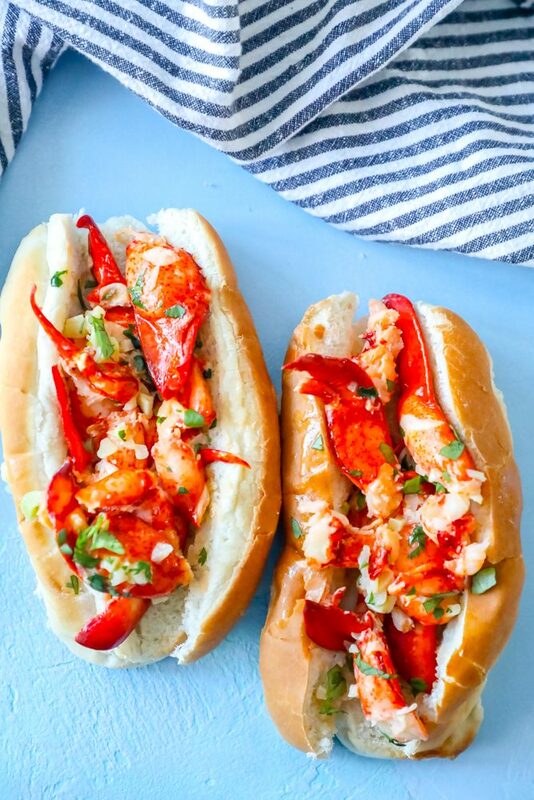 If you love these easy naked garlic butter lobster rolls, please check out my other knockout lobster recipes! I’ve completely offended hundreds of thousands of people for making a lobster roll without mayo – which is a pretty big offense. 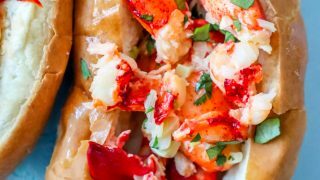 I promise the garlic butter sauce takes this lobster roll to a crazy delicious place you never saw coming – but if you are seeing red (and not just from your lobster) – you can do the following for a more traditional (with mayo) recipe. -Reduce butter to 2 tbsp – just enough to soften the garlic and shallots, and toss with lobster meat and wine. -Let cool slightly, then toss with 3-5 tbsp mayo and serve immediately. If you’re keeping low carb – this recipe is FANTASTIC without the bread, too! Spoon the lobster and garlic butter sauce over salad or in a lettuce cup – it’s also divine over zoodles or cauliflower rice! You can also make this an easy lobster pasta by spooning the garlic butter sauce over pasta or even rice. If you love this garlic butter naked lobster rolls recipe as much as I do, please give it a five star review and help me share on Facebook and Pinterest! In a large pan, melt 6 tbsp butter on medium heat. Add in garlic and shallots, stirring occasionally, until fragrant and soft - about 4 minutes. Stir in wine and increase heat to high. Stir in lobster meat, lemon zest, and tarragon. Cook to piping hot and sauce is reduced, about 5 minutes. Slather softened butter on rolls, inside and out. Add rolls to a hot griddle pan and toast on each side. Scoop lobster meat and garlic butter sauce into roll that has been toasted. Serve immediately with drawn butter if desired. What do you do with the 3 tablespoons of salt listed in the ingredients of this recipe? This is the way all lobster rolls should be! Love that garlic butter. This is my favorite! I love how easy this recipe is! These lobster rolls are definitely a keeper! We didn’t even miss the mayo. Loved it! These lobster rolls were amazing!!! Such an easy recipe, thanks!